It all started with Coridor. I wanted a creature that could have a liquid form; something a little unique and different. Also for some reason, I wanted a character that would be named after something weird; something that is not really a name used for a creature, more an object or place. I thought up all the Neonaarks' names before I thought up their looks. 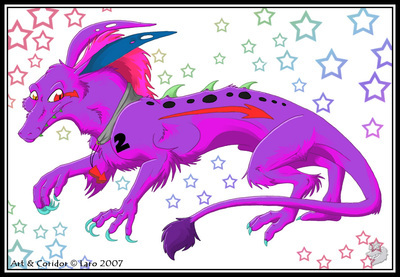 Often mistaken for dragons, they are in fact aliens. They have a natural form and it is goo. I may have been inspired by Odo from Star Trek Deep Space 9 for that. I think that is probably what put the original idea for the goo forms in my head anyway. 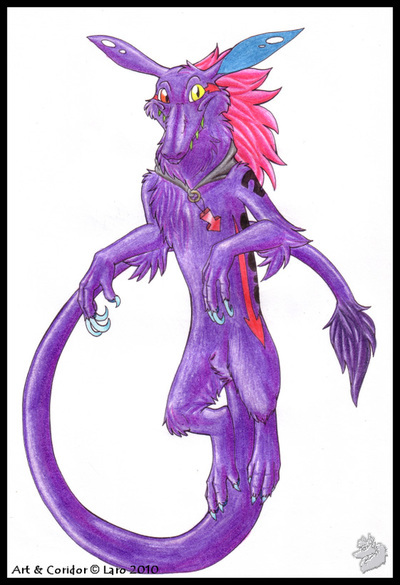 With Coridor, to reinforce the liquid form idea, I decided to shade him reverse, giving him a strange almost luminescant sheen even when he's in his furred form. 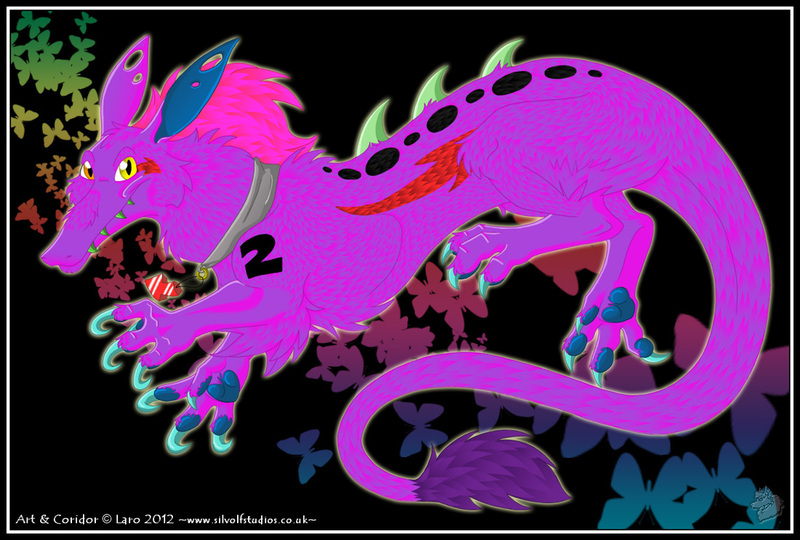 So all the Neonaarks are shaded in reverse colours that work with their main body colour. Coridor is shaded in a red/purple and Sterreo is shaded in a red/orange while Csentrifuuge is shaded in a bright blue. Since I love long bodied short legged things (like Dachshunds, a dog I grew up with since our neighbor had three of them), I thought why not have Coridor able to lengthen his body? His legs are short; he can't lengthen those but his body and tail can get longer and shorter at his own will. This was used for the species as a whole, as well as the arrow theme. I developed a liking for arrows with a fan character I had once called Arrow. He was a Kitsune. I didn't draw him much but I liked the arrow idea and decided to keep it for a later date and an original character. I like this as a theme for the Neonaarks. Of course, the real theme for them as a species is that they relate to the TV shows I watched as a child in the late 80s/early 90s. I LOVE the 80s. Things were big back then; hair, colours, clothes, ideas. A lot of cartoon characters were brightly coloured and a lot of them played in bands. The Neonaarks are really my homage to the 80s. I loved the characters back then. There were aliens and wacky coloured anthropomorphic animals, endless superheroes and crazy fashions. Hair metal was big and so were punks. A lot of cartoon characters I liked had mowhawks and Sterreo's hair reflects that. He even has an "80" tattoo on his shoulder. Coridor's teeth were inspired by Rude Dog's teeth from the 80s show, Rude Dog and the Dweebs. Csentrifuuge's guitar was inspired by my own love of guitars and their music, an instrument I play myself. So these guys are very personal to me. They reflect my history and childhood. Will there be anymore Neonaark characters? Well I don't think so right now; three is enough! I like to have characters I can draw a lot and not make endless ones and then never draw them. 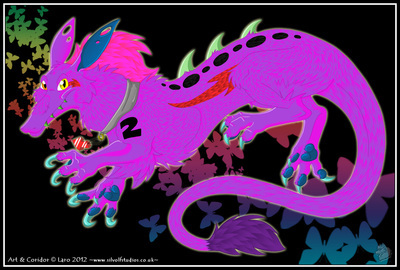 I have all the looks and design ideas I want with the Neonaarks for now. I've brought my love of metal into the equation, my second favourite type of music next to 80s and I think these three Neonaarks will be something big in the future. I had the idea for this guy for a while. His design was already in my mind when I drew him. He has elements of other characters in him. For example, he has a mane like my characters Snarl and spots like Deazel. 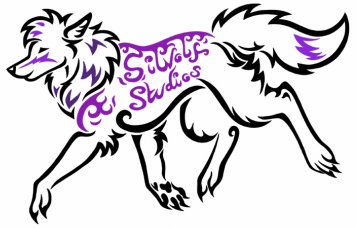 The arrows are taken from an old character of mine, Arrow the Kitsune. I never really used that character much but the arrow idea was neat so I used it here. His back feet were supposed to be like those of monkeys but I'm not very good at drawing them so I had to change it. He has opposable thumbs on his back feet as well as front and is a very good climber, preferring to be up high somewhere. 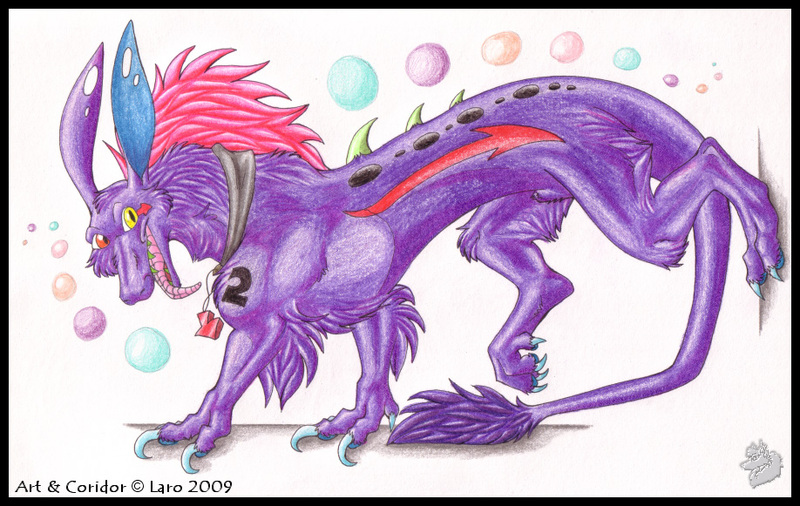 I shaded him in odd colours to make his fur look sort of pearlescent. 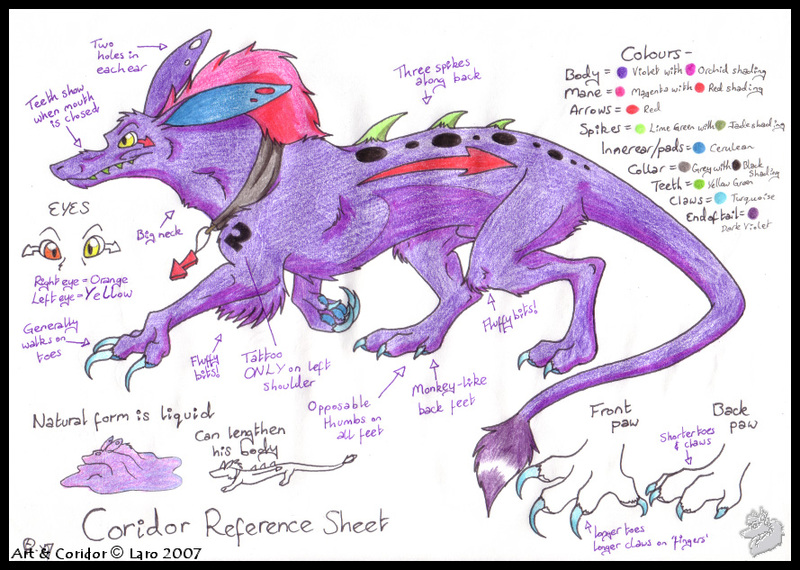 Coridor can shape change, he can become his natural form; a liquid entity and his body can vary in length when he wishes. Thats about it really. He's like a sinister dark idea who plays pranks on people and appears round the corner when you least expect it. 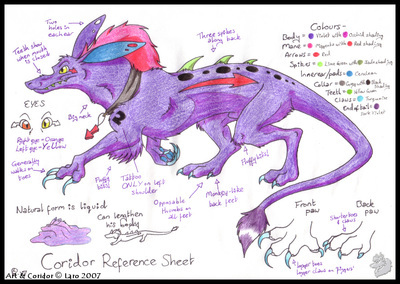 And that was the main idea behind Coridor, who I first drew June 10th 2005. I had the idea a while before then though. I wanted a character who was far out and funky, reflecting a little of my personality as most of my characters do. But also something that was a little mysterious and strange. 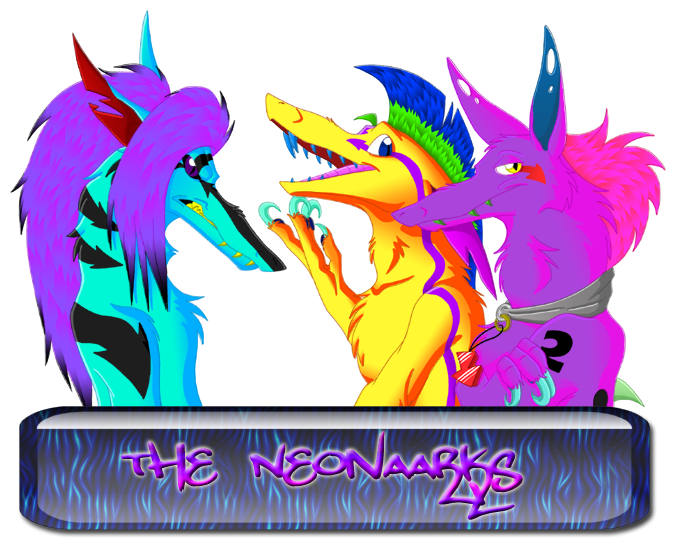 And so Coridor the Neonaark was born! He isn't that sinister in the band universe though lol! 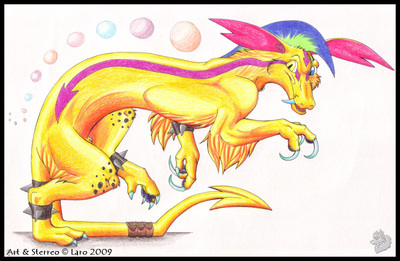 I made Sterreo a couple of years after Coridor. He is Coridor's younger cousin. He's more of a teenage character whereas Coridor is an adult. 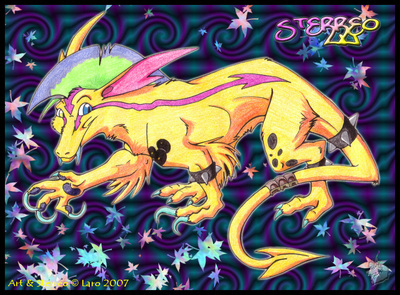 So Sterreo is an older teenager. He sings at a slightly higher pitch to Coridor so they can be recognised apart when they're singing. I wanted another Neonaark called Sterreo. As with Coridor, I had the name before I made the character. Sterreo is still learning about much of the music industry and can be reckless but he's very good at thinking up lyrics; he's very poetic and pretty artistic. 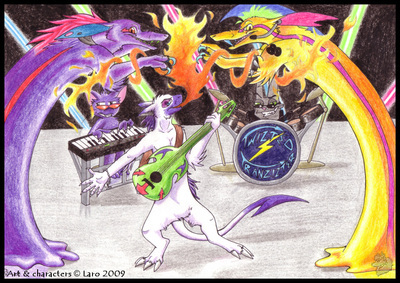 Although its left to AvistA to do the effects for the band with Meo's help, the music and lyrics are mostly the work of Sterreo. Coridor doesn't let him have all the fun though and often steps in to add his own style and flavor to the lyrics and music. Coridor has a band. The name? 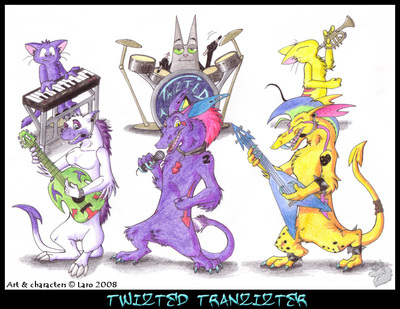 Twizted Tranzizter. The music? 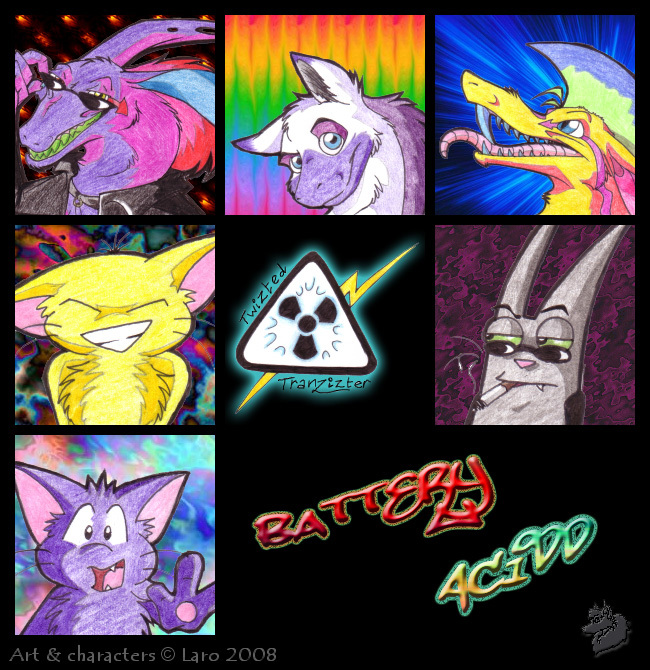 Electro synth 80s style metal and my inspiration was music by the band, Less Than Jake and the anime Initial D's music. 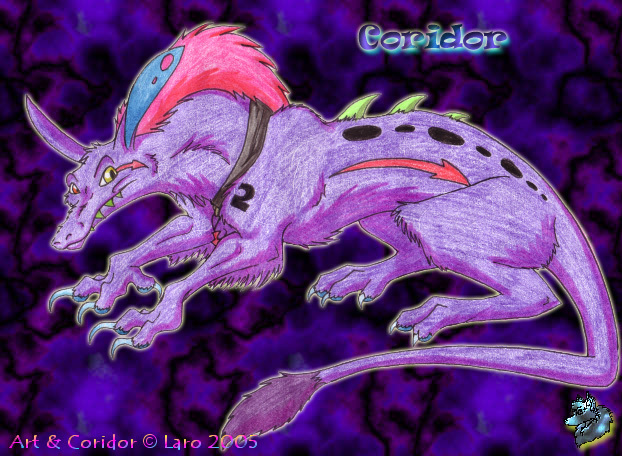 Coridor is the lead vocals in the band and he also plays secondary guitar. Sterreo plays bass and sings. He'll also play keyboard if needed. AvistA is lead guitar and singer. Meo is keyboards or trumpet. They can play different instruments and do different jobs depending on what is needed for the song. Their gigs involve pyrotechnics from AvistA, Coridor and Sterreo turning to their natural liquid state and showing off around the stage, ultra violet and black lights, large screen videos behind the perfomance and neons. Got a rep for rockin; right across the land! Another few years later I made this guy, Csentrifuuge. He's a kind of antagonist and rivals Twizted Tranzizter. He sings black metal mostly but also death and industrial metal. 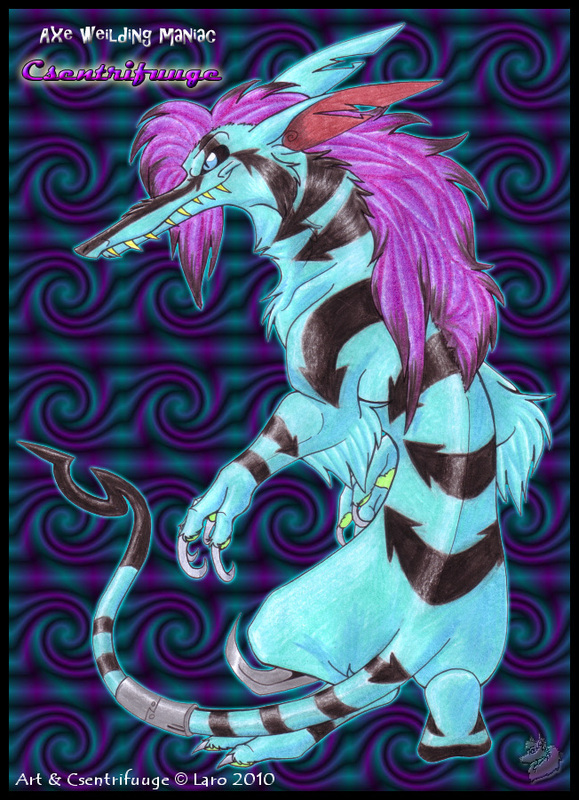 I wanted a character called Centrifuge and I wanted him to be a stripy Neonaark. So I miss-spelled the word in the normal Neonaark names way and made the stripes into arrows since that is a running theme with them. Coridor and Sterreo sing 80s/electro/synth while Csentrifuuge sings black/death metal with a hint of 80s. He has hair metal style hair from the 80s, keeping the 80s theme that my Neonaark species has but he lacks accessories. Coridor has a collar, Sterreo has spiked bracelets and straps on his tail. 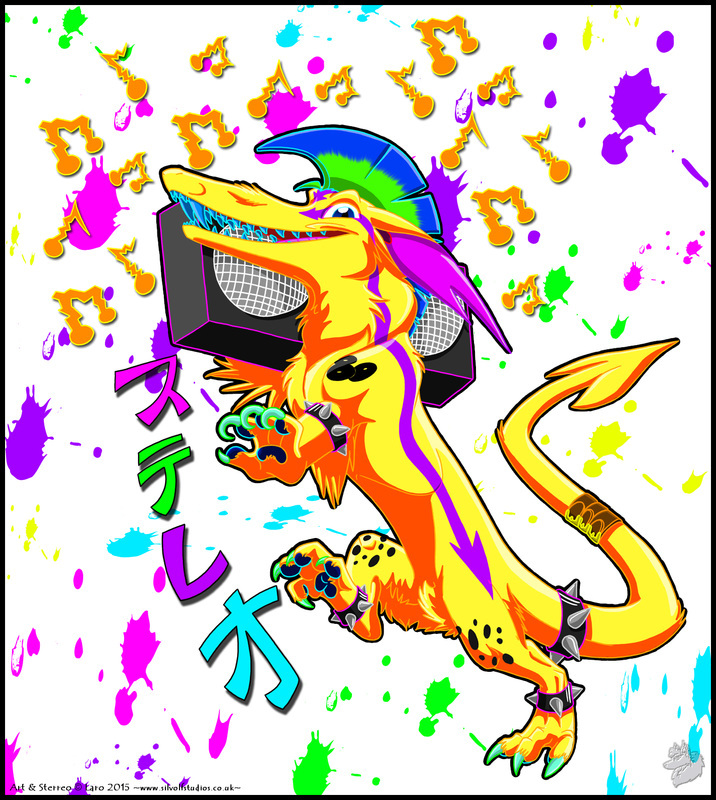 Csentrifuuge only has a mysterious metal band on his tail. I used to draw mind control collars when I was a kid in a similar way to how this one looks. So who knows what it's for! 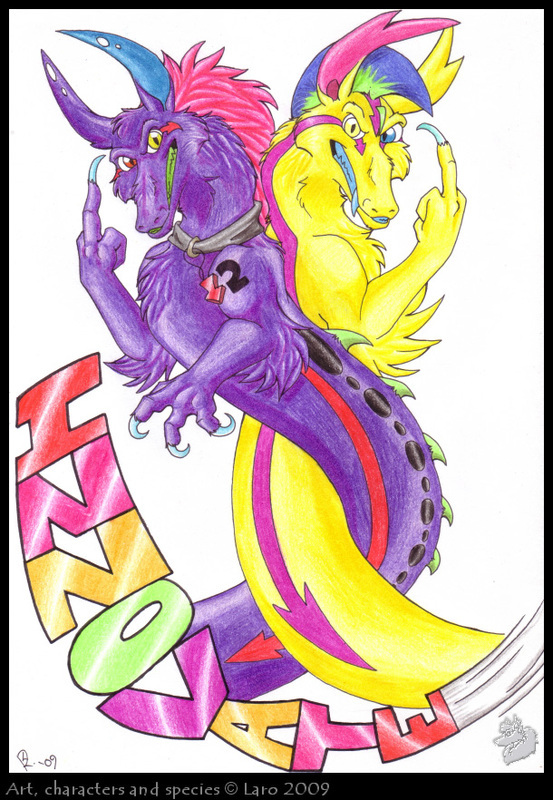 His hair is neon purple btw, my scanner likes to make that pink for some reason. 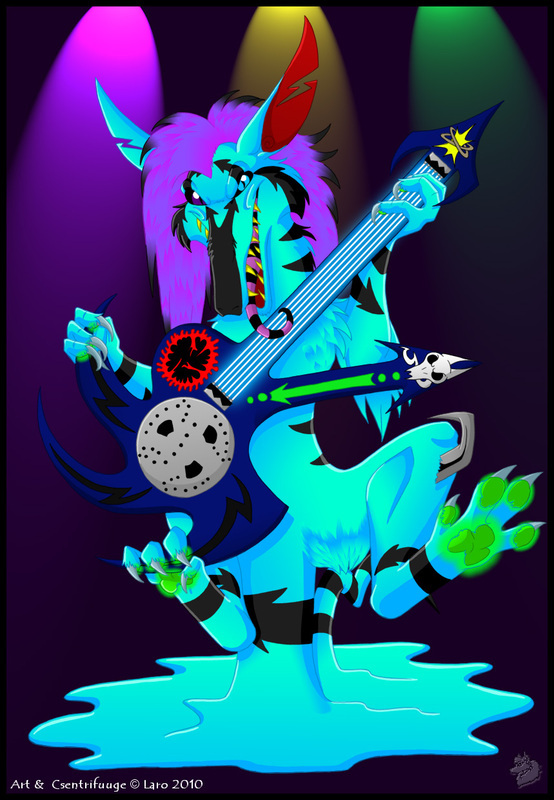 He plays an electric guitar called Nerve Crasher, that's powered by the souls of the damned. The guitar is dormant most of the time but when he performs, it becomes active and the center of the guitar rotates to drag souls in or spit them out accordingly. He's spiteful and unpleasant most of the time, also sneaky. He basically lives for the music and collecting more souls. He wants to defeat Twizted Tranzizter and ultimately take over the band and destroy it but that will of course, never happen. He also believes in performing solo; he thinks you don't need backing vocals and performs all his music entirely himself, his guitar being capable of creating different sounds other than those specifically limited to what a guitar can do (that was inspired by when I saw Bill Bailey's gig a couple of years back, Bill played a guitar that could make the sounds of an entire orchestra if he wanted to). His name is pronounced Sent-ri-fewj with the G making a J sound at the end. The Neonaarks are © Lara Ryan 2005 - 2019.